This weekend (September 10-12), I’m participating in Blog Fest, an event organized by Cinammon at A Journey of Books. Blog Fest is basically a weekend full of giveaways and contests all over the blogosphere, including lots of book blogs! So … here’s a warm welcome to readers, both old and new! As part of this weekend’s event, I will be giving away a copy of one of the books that I will be teaching in my senior level English course this semester. I’m in the middle of reading it right now, and I hope that the winner will find it as interesting as I currently am. I am blog #144 for this weekend’s festivities. At the bottom of this post, there is a link to the next blog for you to “hop” over to! Don’t forget that if you use the tracking system over at A Journey of Books, you will be entered into the massive Blog Fest central giveaway. 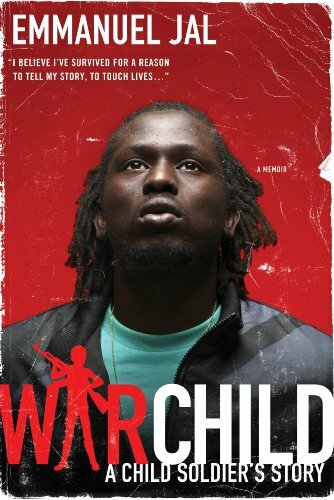 In the mid-1980s, Emmanuel Jal was a seven year old Sudanese boy living in a small village. But after his mother was killed and his father Simon rose to become a powerful commander in the Christian Sudanese Liberation Army, fighting for the freedom of Sudan. Soon, Jal was conscripted into that army, one of 10,000 child soldiers, and fought through two separate civil wars over nearly a decade. Orphaned and adrift, Jal lived through horror: marching through miles of desert toward Ethiopia, past the bones of adults and children who had fallen on the trek; witnessing the deaths of friends and family members; killing soldiers and civilians with a gun he could barely lift; starving to the point of near-cannibalism, and coming to the edge of suicide. Remarkably, Jal survived, and his life began to change when he was adopted by a British aid worker. He slowly began the journey that would lead him to music: recording and releasing his own album, which produced the number one hip-hop single in Kenya, and from there went on to perform with Moby, Bono, Peter Gabriel, and other international music stars. Shocking, inspiring, and finally hopeful, War Child is a memoir by a unique young man determined to tell his story and in so doing bring peace to his homeland. This giveaway is open between 12:00am on Friday, September 10th and 11:59pm on Sunday, September 12th. Open internationally, to anywhere that The Book Depository ships. The winner will be contacted by email and has 24 hours to respond before I select another winner. Fill out this form – this giveaway has now closed. I will have mine up soon! Hopping by from BlogFest. Happy Friday!!! Great giveaway! Thank you for making your contest international!